Supplies are due to arrive tomorrow for a couple of other requests recently received – thank you Facebook! – so it looks like Thursday will be a soapy fun day. Wish it could be tomorrow after everything arrives, but the timing is bad. UPS is rarely consistant in their arrival time. Sometimes it’s 9:30 am, while other days it’s as late as 7:30 at night! So, tomorrow will be a receiving day, and household tasks. But there are some wonderful fragrance oils in one of these orders. In addition to a straight forward patchouli fo, there also White Tea & Ginger, White Peach and Silk Blossoms, Torrential Rains, and Beach Bum. This last one is an attempt at finding a suitable replacement for my long time favorite, Beachcomber. I don’t have any info on the notes that were in Beachcomber, so I don’t know if it’s a good swap or not. I’m still mouring the loss. Painful! That one smelled fabulous! Made me weak in the knees. White Tea & Ginger has some wonderful layers to it including one of my favorites – bergamot. Then there’s White Peach & Silk Blossoms which has the sweet subtle notes of peony. Beach Bum is my candidate for replacing Beachcomber with notes of jasmine, and last but not least the Torrential Rains with jasmine. These are not all of the notes they have, just the ones that strike my fancy strongest and leaves their proprietary blends composition safe. If you’re interested in these fragrances, please feel free to visit their site at www.naturesgardencandles.com where you’ll find these plus of host of hundreds of other items to make the most glorious soaps your skin’s ever had the pleasure of experiencing, candles, diffusers, and so much more. A wonderful site! While we’re talking shopping sites, there’s another one that I found before any other site for soap making supplies – Wholesale Supplies Plus. www.wholesalesuppliesplus.com carries everything you need to get started from the ground up including loads of links and helpful guidance to start your own business or protect the one you’ve already started. Their forum is one of the best and friendliest you’ll ever find. I love spending time in there discussing all different methods of soap making from Melt & Pour, Hot Process, Cold Process, CPOP, to other bath & body items like lotions, lip balms, body butter, lotion bars, etc. There’ s something in there for every soaper or bath & body crafter. Remind me to never, ever again have my orders shipped to work. When they arrive, they usually arrive at the wrong spot rather than my office, even though the UPS guy is there every single day! Explain to me why my stuff goes someplace else while work’s goes directly to them! I have to wait for it all to get sorted out then pass it around from department to department. I still haven’t laid eyes or hands on the order than allegedly arrive yesterday morning bright and early. So, where did it end up? Maybe today will be my lucky day. One can only hope. This order includes the pH testing equipment to check newly made or cured soaps for lye presence. I still haven’t been able to test my Cottonseed bars because they testing supplies haven’t gotten through to me! Grrrr! So, you wonder why I have things sent there instead of home…I worry about packages arriving while I’m at work and they’ll be stolen from my porch. I live in the city, so stuff just sits on my porch if it arrives in the morning. It’s never a consistent arrival time either. But I guess I’ll have to risk it and have things sent there anyway so they’ll show up when they say they have. (Unless of course they grow feet and walk away) Just smack me upside my head if I ever get the crazy notion to have it sent to work, ever again. I give you permission. Last night was a bit productive and I had an ‘Aha!’ moment when a friend suggested I get a Facebook page for my business. So, without waiting another second, I set it up. I’ve uploaded a crop of pictures of the soaps I currently have, but will also load up everything else that isn’t soaps too, to make it a full roster of goodies. The nightgowns will come in sometime very soon, though I’m not sure when as life goes on here at home and other things require my attention. I really need to get going on getting in the supplies for the shampoos and conditioners, plus make a batch of lip balm to have ready for sending and photographing. There are two expectant mothers that I really want to get gift baskets to, but haven’t had the time to pull them together. Soon. Very soon. One ‘girl’ basket and one ‘boy’ basket. Shampoos, conditioners, and additional lines of lotions! In addition to the lip balms and many types of soaps. Just a quick heads up. Working on the details right now. More again very soon! 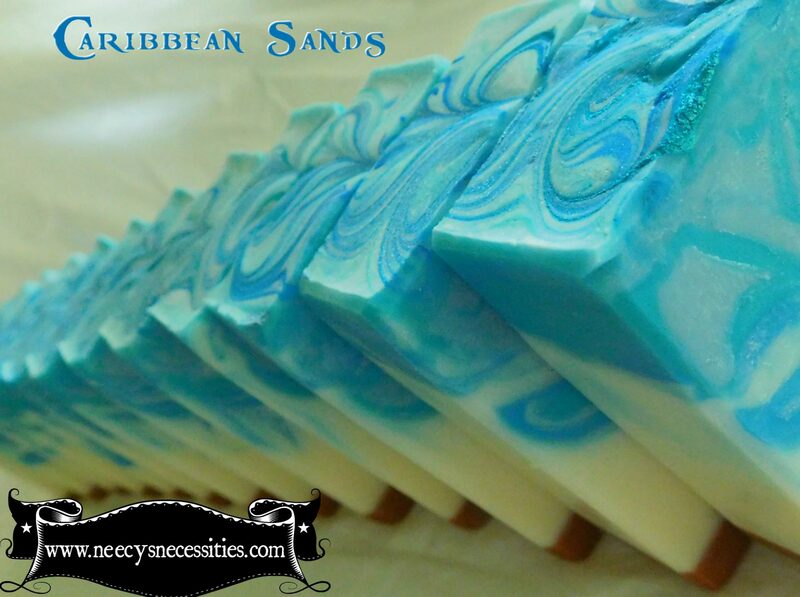 Additionally , I’ll be posting more pics of the soaps currently in stock with prices. Smiles!!! These little creamy-coloured beauties are curing a bit since they’re still a bit soft, despite using the hot process method for their production. They smell fabulous though, making the entire back half of the house smell like Clean Cotton (aka Febreeze, according to my dear hubby). Washing out the little Gladware tubs I use as soap molds was a wonderful aromatherapy session. It smelled sort of like ironing day for a moment. Those little inexpensive plastic storage containers are invaluable for this use! They last for quite a few batches, but if one ever meets an early demise, it’s not huge loss and it’s just that one piece, not the entire 25 dollar mold! I didn’t grease or oil them with anything to prevent sticking. Just poured in the soap and let it set up until it was firm enough to push out, which was actually only around 2-3 hours. According to most information, the oils used should make for a hard bar, but I guess that’s after it’s fully cured or was cooked longer than I cooked it. I poured at the light trace stage. It probably could have/should have gone longer, but that’s ok. Soap can be a bit forgiving in this stage. I’ll get the testing material tomorrow or the next day and I’ll test it then to see if it’s safe to try in a hand washing. No hurry as it still needs to cure a bit more anyway. I don’t want it to wash down the drain too quickly. She’s at it again! She’s throwing things together and watching to see what happens. Everybody keep back, keep your head down. This could get ugly. I’m trying out a recipe worked up with a soapmaking software program, using Cottonseed oil, Palm oil, and Coconut oil. My D.H. works with cotton quite a bit, so we’re both curious to see what will result from my mad experimentations. The FO will be, what else, Clean Cotton. The FO was purchased from Nature’s Garden, a supplier I’ve recently come to trust and rely on for top quality FOs and sundries for soaping. The software is SoapMaker 3.0. It’s an invaluable tool for running the numbers for your oils/butters/fats amounts, then calculating for you how much lye and water you’ll need to make this soap formulation. It really saves a lot of time and frustration. I’m currently chilling down the water so I don’t have Vesuvius in my back porch, Once it’s cool enough, in the lye will go. A light touch of blue might be used, although with cotton, white is nice, too. The program calculates for a 7% lye discount so all the lye will be taken up in the oils with a bit of the oils left for a slightly superfatted soap as a result. These amounts are by weight as always. Never by volume. Based on a 7.0 scale this should give me a nice hard bar with stable, fluffy lather and good moisturizing qualities. This will be done as HP soap, making a very small batch for this experimental run. If it turns out well, it can always be scaled up. It could be done as a CP soap, but I wanted to be able to get it out of the mold and able to test it asap. A new supply of pH strips is coming this week to be sure of the usability of the soap. So, off I go. More later…..
A square Knotwork design with a slight touch of green tint. The Heart is where my home is…and this one smells wonderful!